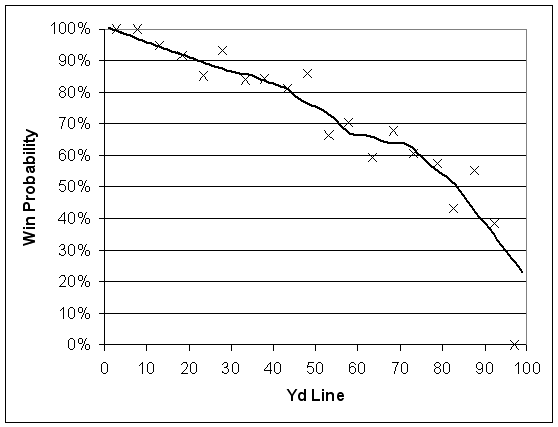 As we can see, teams with the ball at their own 30 (70 yards to go to the end zone) win around 64% of the time. Makes sense, that’s about what we expect for teams receiving the kickoff and the own 30 is around the average starting position. So, random thought 1. A quick one, and without wanting to start the whole debate up again, we can see from the graph that an overtime system designed to give each team a 50% chance of winning would have teams starting with the ball at around their own 15. How to manage this change? I don’t know, because I quite like having a kickoff. Perhaps they could move the kickoff spot up a bit to make touchbacks more likely and generally reduce the average return length. Random thought 2, of more interest to me, spawned out of the Eagles-Giants game. Somehow, the Giants were caught unawares with the Eagles onside kick in a situation where I’m sure everyone reading this site was expecting one. But teams hardly ever seem to kick onside at the start of overtime. To see whether they perhaps ought to consider the surprise onside kick, we can use the win probabilities to solve for the break-even onside kick success rate needed to make the tactic worthwhile. A standard kickoff gives the kicking team approx. 0.36 WP. 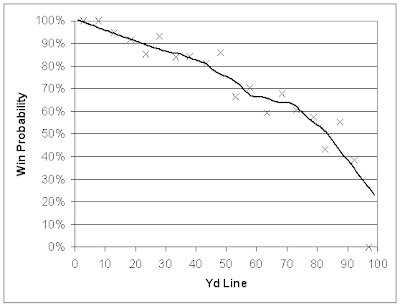 If x is the recovery rate, an onside kick will give them the ball at their own 40 for a WP of 0.67 x% of the time and (1-x)% of the time give the opponent the ball with 40 yards to go, for a WP of 0.17 to the kicking side. Solving for x, the break even success rate is 38%. From here Brian showed how surprise onside kicks are successful up to 60% of the time. So from that, I conclude that the surprise onside kick is a tactic that coaches should be considering. And indeed, given how few overtime games teams have of a season and the fact that no-one tried an onside kick at the start of overtime from 2002-09 (at least according to the database I’ve got) it would certainly come as a surprise. I'd previously considered the overtime onside kick, but never bothered to do the math. Good to know! Have you finished parsing the play-by-play data? How about this: in overtime, adjust the kickoff line and have no touchback. If the receiving team doesn't get the ball out of their end zone, they start on the 1 yard line. If the ball sails completely through the end zone without touching the ground, that can be a normal touchback. But if it bounces, 1 yard line. Just move the kickoff line forward for the first OT kickoff and don't worry about the increased chance of a touchback. The receiving team still has the greater chance to win (starting at the 20) but it's much closer to 50%. There is even a minor incentive for the kicking team to try and kick the ball to just short of the goal line and hope to pin the returning team inside the 20. Jason - not entirely finished parsing it, that's why I started with overtime. It's easy to link each first down with whether the offensive team won, and you don't need to worry about score difference.